For the Adventure Field in Sonic Adventure, see Mystic Ruins. 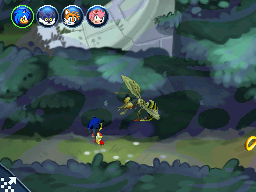 In Sonic Chronicles, the team travel to a section of Mystic Ruins that's a little more dank and swamp-like than the rain forest seen surrounding Pachacamac's city in their previous visit. Nonetheless, the area remains an archaeological cornucopia of Knuckles Clan ruins and blanket vegetation, infested with all manner of supersized creepy-crawlies. Mystic Ruins is also the location of another of Eggman's abandoned bases - although this one isn't really abandoned, having been appropriated by the Marauders, who have imprisoned Knuckles in the lowest level. When Sonic and team arrive in the Tornado, the area is under blockade by GUN in order to prevent an expected Marauder assault on Angel Island, which is floating overhead. However, the human forces are thrown into disarray when the Marauders deploy chemical weapons within the ruins. Big the Cat, who was fishing nearby, seems to be the only one with a hardy enough constitution to weather the poison fumes, and with his help Sonic is able to access the Marauder base... just in time to see Knuckles break out on his own. The music in this area is a Remix of Final Fight from the Genesis version of Sonic 3D Blast. This page was last edited on 29 April 2018, at 17:10.